We can conclude that x + y – xy is a real number. 3. If 3x+4y+ 2z =2 0 and 8a – y + z = 4, then find the value of x+y+z = ? Here, No. of unknowns is not equal to No. of equations. 4. There are n persons who can do a job in 27 days. But due to some reasons, 6 persons did not come for the work. 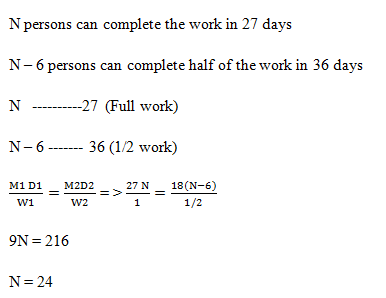 The remaining persons took 18 days to complete half of the work. What is the value of n? 5. In a company, the salary of a sales executive is partly fixed and partly based on his sales. A sales executive earns Rs. 22000 in a month for selling 300 units and Rs. 20000 in the next month for selling 250 units. If he sells 400 units in a month then how much amount he earns per unit? Let the salary be Rs. x and commission is Rs. y per unit sold. 6. _____________is equivalent to right ___________whose base is a circle. As B2– 4AC is negative the roots are imaginary. 8. Catherine was born when her father was 20 years old. At present the product of ages of Catherine and her father is 125, what will be Catherine’s age after five years? 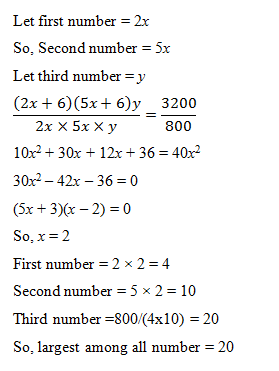 3) If 3x+4y+ 2z =2 0 and 8a – y + z = 4, then find the value of x+y+z = ? 4) There are n persons who can do a job in 27 days. But due to some reasons, 6 persons did not come for the work. The remaining persons took 18 days to complete half of the work. What is the value of n? 5) In a company, the salary of a sales executive is partly fixed and partly based on his sales. A sales executive earns Rs. 22000 in a month for selling 300 units and Rs. 20000 in the next month for selling 250 units. If he sells 400 units in a month then how much amount he earns per unit? 6) _____________is equivalent to right ___________whose base is a circle. 8) Catherine was born when her father was 20 years old. At present the product of ages of Catherine and her father is 125, what will be Catherine’s age after five years?